Barack Obama’s chief speechwriter, Cody Keenan and Pat McDonagh with Swinford based sculptor, Mark Rode, at the unveiling of the reknowned sculptor's statue of the Obamas at The Barack Obama Plaza. 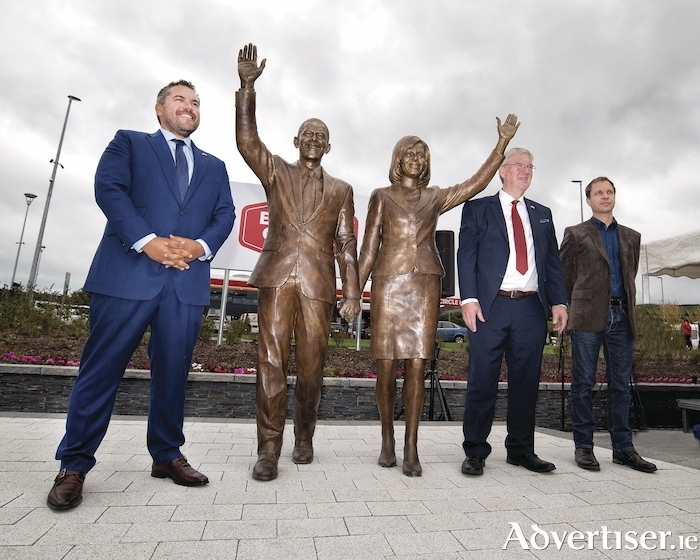 Barack Obama’s former Chief Speechwriter, Cody Keenan recently unveiled a statue of the US former President and First Lady, Barack and Michelle Obama at the Visitors Centre at The Barack Obama Plaza by Swinford based Sculptor Mark Rode. Cody Keenan is best known in this country as the author of the iconic ‘Is Féidir Linn’ speech delivered by the former President Obama on College Green in Dublin during his visit here in 2011. Asked if the former President would visit his Moneygall ancestral home in the near future, Keenan said, jokingly that he was to report back to the former President on the likeness of the statues. The renowned sculptor, Mark Rode, has created an intimate bronze statue of the couple in recognition of how The Barack Obama Plaza has become a popular stopping point for so many along the M7 Motorway. The owner of the Plaza, Pat McDonagh, has committed to helping ensure the story of Obama’s Irish Ancestry and his connection to Moneygall village is promoted stated: "There is still a very deep connection between Barack Obama and the Moneygall area. A lot of tourists that come to our Barack Obama Visitors Centre are keen to learn about his connection with the area. "These are tourists from all over the world and they might not have known about his ties to the region. This statue of Barack and Michelle will help to strengthen the understanding of those ties. I am delighted with this statue by Mark Rode and I am particularly delighted that the former President's chief speechwriter, Cody Keenan, was on hand to unveil it." Mark Rode studied art at the Queensland College of Art in Australia. He moved from Australia to England in 1998 where he set up a studio and exhibited work in London. After first living in Dublin and then Leitrim he set up a studio and bronze foundry in rural Mayo and completed his first public art commission in 2004. Over the next 14 years Mark Rode completed many public sculptures including the Quiet Man statue in Cong, The Kerry Football statue in Tralee, the Tour de France statue in Enniscorthy, the Titanic Memorial in Laherdane, the Thomas MacDonagh statue in Cloughjordan and many more. He has also created sculpture for private commissions and exhibits with the Oriel Gallery in Dublin.